Snowfall at Sunrise – Watson Lake by Pat Kofahl - Together, We Make Memories! 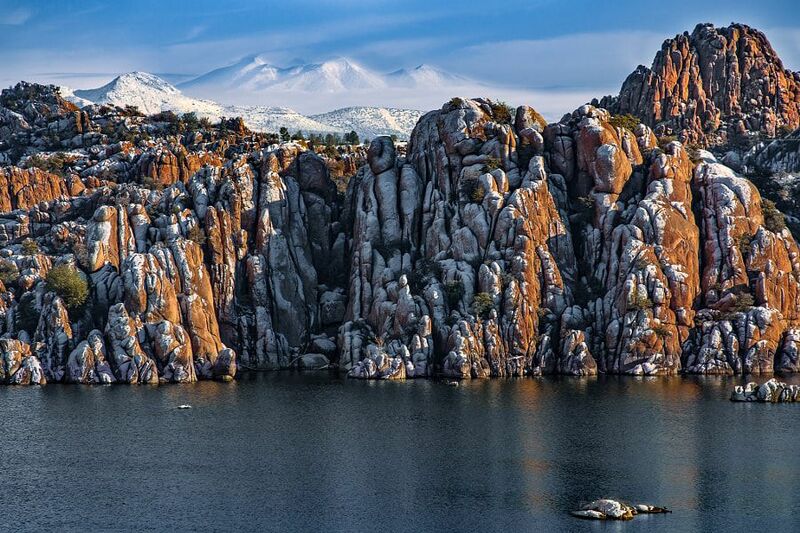 Ask most people what they think of when you say the word “Arizona,” and chances are you’ll hear the words “cactus,” “desert,” “dry,” or “flat,” yet, behind these red rocks that surround Watson Lake in Prescott stands Humphreys Peak, towering 12,637 ft. (3852m). With 194 named mountain ranges, the state is hardly flat. In addition to the sub-arctic tundra found on the San Francisco peaks, The state also has more deserts than any other: Sonoran, Mojave, Painted and Chihuahuan. This fine art image by Pat Kofahl is available in multiple sizes on paper, canvas, metal and plexiglass. Prices start at $49.00!